With much fanfare, the world’s newest cruise ship, the Disney Fantasy, sailed into Port Canaveral, Florida, early this morning. Fireworks lit up the sky as the ship came into its home port at dawn. Fireboats sprayed water cannons like fountains, escorting the 1,120 foot long Fantasy into the port as crowds lined up along the shoreline to watch the ship come in. The ship was christened in New York City last week after sailing across the Atlantic, from Germany, where it was built. The Fantasy is to join its sister ship, the Disney Dream, as part of the Disney Cruise Line (DCL). DCL has four Disney themed cruise ships in all. The Fantasy, Dream, and Magic, will all be based at Port Canaveral. The Disney Wonder is currently based in Los Angeles and will be moving to Miami, FL, later this year. 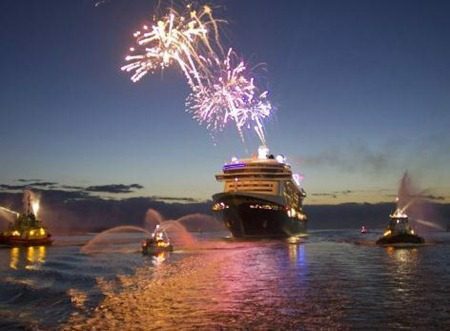 The Disney Fantasy can sail with up to 4000 passengers and 1450 crew and cast members. Its maiden cruise is scheduled for March 31, 2012. It will be sailing 7 night cruises to the Caribbean.